Enjoy a deep night's sleep with the Holistic Silk One Strap Pure Silk Anti-Ageing Eye Mask , a luxurious eye mask infused with a subtle Lavender fragrance. 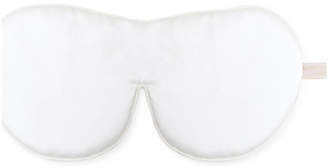 Both technical and beautiful, the hypoallergenic eye mask is made from (and lined in) 100% 22 momme Mulberry Silk which feels light, comfortable and super-smooth against skin. Silk contains naturally anti-ageing Sericin and helps to prevent creasing and pulling of the skin to protect and soothe the delicate eye area while you sleep. Unlike cotton eye masks, the silk mask won't absorb night creams or skin's natural hydrators; it actively helps to keep skin feeling hydrated while you sleep. Specially created to help you sleep more deeply, the tried and tested sleep mask completely blocks out the light and is scented with real Lavender to subtly perfume the air to create a soothing atmosphere. Comfortable and non-restrictive, it stays secure with one soft elasticated velvet strap. Arrives with luxurious organza bag for safe storage. Dimensions: 24cm x 12cm.